I always thought that whenever an ESXi driver is loaded then it would detect and configure any PCI devices that it supports, but the ahci driver of ESXi 5.5 behaves differently: Even if manually loaded (with vmkload_mod ahci) it will only configure the devices that are explicitly listed with their PCI IDs in its map file (/etc/vmware/driver.map.d/ahci.map). Then reboot the host to make the change effective. I am providing this package (sata-xahci) in both VIB file and Offline Bundle format. If you need the support at installation time then you can build an ESXi installation ISO that already includes the package using either ESXi-Customizer or the ESXi-Customizer-PS script. Just post the output of this command, thanks! Update (2014-12-03): Unfortunately, I had to disable commenting on this post, because new comments will no longer be displayed (although they can still be added). It looks like we hit a Blogger limit or bug here?! Please send an e-mail to sata-xahci@v-front.de instead, but please read through the FAQ below first. I will just ignore any questions that are already answered there! It is also mandatory to include the output of the lspci command above! Update (2015-04-18): My sata-xahci package still works and is also necessary with ESXi 6.0 if your SATA AHCI controller is not detected out-of-the-box. So I changed the title of this post accordingly. In the meantime a lot of recurring questions and issues have been posted in the comments of this blog post. Before posting the same questions over and over again please read the following information and FAQ before posting. Thanks! PLEASE read before asking questions! 1. A lot of modern SATA controllers also have RAID functionality, but they are no real hardware RAID controllers, but need software/driver support to implement RAID functionality. Please note: This driver support is not available in ESXi, so these controllers can only be used in AHCI, but not in RAID mode! If configured for RAID mode the device will be shown as "Class 0104" by "lspci -v", and they might also expose a different PCI device ID when being in RAID mode. The same applies if your controller is shown as "Class 0100" (SCSI Controller), "Class 0101" (IDE Controller), Class "0105" (ATA Controller) or Class "0107" (SAS Controller). I can really only help you with SATA Controllers (Class "0106") configured for AHCI mode! Be sure to configure the controller for AHCI (not RAID or anything else) mode in your computer's BIOS before you try to use my package and the ahci driver! 2. 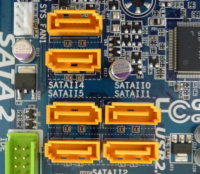 If you have multiple SATA controllers on your computer's motherboard and/or as add-on cards then you might get confused about what SATA (and eSATA) ports belong to what controller. So if the controller shows up in ESXi, but not the attached disks, then make sure that the disks are connected to the right ports. 3. I am not able to provide you with a driver for non-AHCI controllers. In fact I'm not able to write an ESXi device driver on my own at all. So please don't ask for it, thanks! be sure to look at Host Configuration / Storage / Devices (not Datastores). You will see the attached disks as Datastores only after you have created Datastores on the devices (via Add Storage in the Datastores view)! 5. If you want to use your controller for Passthrough to a VM (via DirectPath I/O Configuration) then you do not need an ESXi driver for this controller! The sata-xahci package will not help you then. From the comments on this post it looks like ESXi 5.5 introduces issues with Passthrough not working (whereas it worked before in ESXi 5.1 or 5.0). Sorry, I cannot help with that, because I personally do not use Passthrough on any of my machines. 6. If the command lspci -v | grep "Class 0106" -B 1 lists your controller with a name like vmhba0 (or vmhba1 etc.) in square brackets then that means that it is supposed to be supported out-of-the-box and was configured with the mentioned vmhbaX name. There is no need to add its PCI ID through sata-xahci, because it is already included in the standard mappings of the sata-ahci driver. If your controller is detected in this way, but does not work correctly then I'm sorry there is nothing I can do about this! Please note: With version 1.10 I moved the download locations of the sata-xahci package from my GoogleCode page to the new V-Front Online Depot. For download links see the Wiki page of the package. 1) VMware's vSATA controller was introduced in VM hardware version 10 in Workstation 10 and ESXi 5.5. So you can now add a vSATA Controller to your nested ESXi 5 hosts and use it with sata-xahci! 2) See bug info above in "Read before commenting / 4." Incredibly helpful thank you very much. On a different topic: Any chance to get passthrough for the Lynx Point AHCI controller working or is this a definitive no-go? Passthrough is a different story ... It doesn't use the driver resp. should bypass it if ESXi has a matching driver. is there still no chance that this is going to work? And many thx for your work. It helped quite alot!!! The Intel Controller is working, but not the Marvell one, right? I will add the ID of the Marvell 88SE9123 to the next version of the package. I just double checked, that is correct. Intel works, Marvell is undetected. The Marvell 88SE9123 was added. This is the output for an ASMedia ASM1061 Controller. Is it possible to create a vib for this controller? # lspci -v | grep "Class 0601"
I will not create a separate VIB for each controller, but will update the existing one to support all that are reported to me. So, I will add the ID of the ASM1061 to the next version of the package. Can you let me know when you have a new version of the package scheduled? Can you please add this to the VIB? easy way is to install 5.1 and upgrade to 5.5. It is my understanding that this only works if your controller is already supported by ESXi 5.5. And then you could also directly install 5.5. But many others who have unsupported AHCI controllers lost them when upgrading from 5.1 to 5.5. Can you please add the Marvell 9120 tu the supported controllers? I added the 88SE9120 in version 1.3. This one is already in version 1.2 of the package (see updates to this blog post). I reinstalled it ... It works ! Would it be possible to add the Marvell 9230? I added the 88SE9230 in version 1.3. This on-board ATI AHCI adapter works on a previously customized ESX 5.1, but I can't find a way to customize ESX 5.5, as I tried the customizer with the same file as I used with 5.1, with no success. VERY much appreciated, if you could add. Is there a consolidated list of all adapters that your package supports? I added the SB650 in version 1.4. Currently there is no consolidated list of supported adapters, but get the complete view by looking at all the Updates to this blog post. I wanted to express my sincere thanks and appreciation for your help! Your updates worked wonderfully on my system, and I coupled this package with the PowerCLI instructions to add support for my on-board network adapter, and everything is working wonderfully! I wanted to say thank you and you're doing a great service to the VMware community making ESX accessible on a wide range of hardware. One followup question: Is it possible to add multiple customizations thru ESXi-Customizer, or do they need to be added one at a time and a new ISO rebuilt after each one, if more than one item needs to be added? And yes, with ESXi-Customizer you can add multiple packages only one after the other. Thank you for a such a great job! You gave to my homelab a new life! Does it posible to add support for Realtec NICs? In my lab host use 8168 GE adapter. Beware of unwanted line breaks. Each command is exactly one line! Thanks so much for your work in getting this working and helping everyone with issues they are having. I verified this works on the new intel NUC D54250WYK i5 version with the Intel Corporation Lynx Point-LP SATA Controller 1 (8086:9c03) chipset and ESXi 5.5. Using a Msata SSD for read caching! I test your new 1.5 version => I see at storage adapters new driver "88SE9128 PCIe SATA 6 Gb/s RAID controller with HyperDuo" at now, but with 8 SATA ports! It's strange, because at DX79SR is only two! Serial ATA (SATA) 6.0 Gb/s interfaces through a Marvell 88SE9128 controller (gray). At vSphere client I also don't see any real connected storage disks. Please, can you give me hint, where is problem. Thx. I also have the same as Jakub, I see at Storage Adapters the Device: Motherboard with vmhba1 and vmhba33 but no devices attached. Any thoughts on this one? I do realize it's a different class and says IDE, but it works just fine as a passthrough SATA controller in 5.1. I see you added support for a similar controller (197b:2363) in version 1.4, so hopefully you can add this one as well? I guess this is the same controller, just in IDE mode rather than in AHCI mode. Please change its configuration to AHCI (in you computer's BIOS), install my package and you should be fine. Is it possible to add 197b:2362 anyway, just so I can see if I can get it to work? how i can add two .vib file on one iso ? with ESXi-Customizer you need to run it twice. First add the first VIB, then take the resulting ISO as input and add the second VIB to it. you have some notion of what driver I need for a GIGABYTE Z77M-D3H. No, I don't. Please determine the name and PCI ID of the SATA controller like described in my post. this one is already supported out-of-the-box, and your output shows that the controller was already configured as [vmhba0]. It was detected as RAID controller (class 0104) though, not as a pure SATA controller (class 0106). This is probably a RAID controller that needs software support to implement RAID functionality, but this is not available in ESXi, so you will most likely see only the individual disks rather than the logical RAID volume(s) that you configured. Sorry, there is nothing you can do about that. sorry, no. This one cannot be supported by sata-xahci, because it's not a SATA ACHI controller, but a RAID controller. 3ware used to supply ESX(i) 4.x drivers for this device, but never provided ESXi 5.x drivers, and I'm also not aware of any community effort to create such a driver. No, this is a Linux driver. You cannot use Linux drivers in ESXi without porting them. Could you add support for (8086:8c02) ? This controller is supported out-of-the-box and was configure as [vmhba0] on your system. you don't need to install the vib file to make it available for passthrough. Is passthrough working with other devices? Could you add support for the ASMedia Technology Inc. ASM1083/1085? the Intel controller (8086:1e02) is supported out-of-the-box. Can you please post the PCI ID of the ASM1083/85? Not the same anonymous as before but is this what you where looking for? this device is not a SATA AHCI controller, but a "PCIe to PCI Bridge" device?!? to determine name and ID of any AHCI-mode controllers. Check if your SATA controllers are really configured for AHCI in your computer's BIOS! actually, I have tried to make RAID1 on Asus P8H77-M LE with ASMedia ASM1083 but ESXi 5.5 did not support ASMedia ASM1083. and I think maybe you could help me with my problem. Is it possible to run ESXi 5.5 with raid1 on ASM1083? I still need the PCI ID of the device. Run "lspci -v | grep "Class 0106" -B 1" in an ESXi shell. If this does not produce any output then run "lspci -v" and paste the complete output here. Andreas, thank you for the driver! It helped me to install 5.1 on ASUS M2A-VM HDMI motherboard with AMD 690 Chipset. Before using your driver I was able to manually load ahci module but it remained unloaded after every reboot. May be you know where I can find a detailed information on how ESXi loads modules and why enabled modules can be unloaded after rebooot? Although the problem is solved I am curious on how ESXi works. you are welcome ... but I did not write a driver for these controllers, my package just modifies the configuration files of the already existing ahci driver to also work with your unsupported controller. If you want to dive deeper into this then please read my post here: http://www.v-front.de/2011/08/anatomy-of-esxi-50-installation-cd-and.html. 1) After loading ahci module drives are recognized because ahci driver is suitable for controller even if controller's ids are not specified.in map file. 2) After reboot only modules specified in map files are loaded. 3) Your package adds controller's ids to map files therefore after reboot ahci module is loaded. yes, I guess this is all right. Thank you for all your hard work Andreas. Real benefit to all of us. Thanks for all your Posts, your blog is great! I'm struggling with a Gigabyte Board that worked fine with ESXi5.0, but 5.5 can no longer find the internal SATA SSD during setup. Here's my output, I'd be really happy if you could assist me! For all the listed controllers the ahci driver was loaded and they were made available as vmhba0, 32, 34 and 36. Is you SSD attached to one of these controllers or do you have another disk controller that is not listed? I have a supermicro X7SBL-LN2 with Intel raid 82801HR when I try to install VMWARE he recognizes two discs instead of an array, configured RAID1 you ever had this kind of problem? Sorry, is Intel intel raid 82801IR and not intel raid 82801hr. I have issues with my GA-X58A-UD5 MB with 2 extra SATA controllers no longer supported in VMware 5.5. The following output is from 5.1 for the datastores not detected after an initial upgrade to 5.5. Could zou please provide support for these in a next release? the 197b:2363 was already added in 1.4. I added the 1b4b:9128 in version 1.6. Yes, you are right. I didn’t notice the same PCI ID as the description mentioned a different JMicron chipset. My MB features a JMB362 chip which apparently has the same PCI ID as the JMB363. Thanks to this and a number of your other posts I was able to customize the VMware 5.5 installation ISO to show my Realtek NICs and all SATA adapters. Installation was painless and the box is now happily running with 40GB RAM. I added this one in version 1.7. I have an Gigabyte Z87X-UD3H mobo. 000:006:00.0 RAID bus controller Mass storage controller: Marvell Technology Group Ltd. I tried install only just the vib file, and the zip not! It is necessary? The sata driver is good for me, or only 5.1 ; 5.5? After i change the controller mode from RAID to AHCI, now working!!! I just wanted to take a moment and thank you for the SB700 support and this wonderful walk-through. Like so many I have a lab at home for tinkering as I'm a hobbyist and you got things going again. Thanks so much! Are you still accepting outputs? My output for "lspci -v | grep "Class 0106" -B 1"
0000:0b:00.0 SATA controller Mass storage controller: Marvell Technology Group Ltd. I added 1b4b:9182 in version 1.8! 0000:02:00.0 SATA controller Mass storage controller: Marvell Technology Group Ltd. This controller is under class 100, not 106. Any insight on this thing? "Class 0100" is a SCSI controller. There is no ESXi driver available for the RocketRAID 2310, sorry. My package won't help here (unless you can re-configure it to behave like a SATA AHCI controller?). would you mind add the following SATA controler? I can't see mine controller listed. This controller is supported out-of-the-box and should not need the sata-xahci package!? I have recently installed esxi v5.5 and passed the sata controller back to the same FreeNAS VM. The VM could not see the zfs volume or any connected disks at all. I did a google search to resolve this and found your blog. I've followed your instructions and have SSH into my host and installed your VIB. After rebooting the host my FreeNAS VM still cannot see the disks. I'm now back to using esxi v5.1. It's a Class 0106: 8086:1c02 please. I wouldn't be here if it worked out of the box. if you use passthrough to make your controller directly available to a VM then you really don't need an ESXi driver for it (The device is passed through, but not used by the VMkernel to access the attached disks). From what I have heard passthrough is broken for some devices in ESXi 5.5. Sorry, I cannot fix that. I added this one in version 1.10. 2013-12-16T16:10:25.604Z cpu1:33325)Mod: 4780: Initialization of ahci succeeded with module ID 4146. Oh, I forgot to say, the reconized ahci, is the onboard sata controller, with 1 connected disk. Quick question. So if I were to buy a PCIe card with one of the chipsets listed in your posting, I should theoretically be able to get it working with the info you have provided? Yes, you should be able to get *any* AHCI capable SATA controller working with ESXi 5.5. If its PCI ID is not yet included in my package I can add it once you tell me it. Awesome work here. I have a Marvell 1b4b:9130 . It would be great if you can add it to your VIB. Robert, it's already included (since version 1.5)! Make sure that you have configured it for pure AHCI mode! You won't be able to use the RAID functionality of this device (see section "Read before commenting" in my post). the ahci driver was loaded for both controllers, and I cannot do more than this. I have no idea why the disks attached to them do not show up. Are you sure that you have connected the disks to these controllers? 00:02:00.0 IDE interface Mass storage controller: Marvell Technology Group Ltd.
00:07:00.0 IDE interface Mass storage controller: Marvell Technology Group Ltd.
Can you please add it to support? Class 0101 is an IDE controller, but not a SATA controller. Is there a way to change their configuration so that they show up as Class 0106? I tried contacting the person that uploaded it but he is not answering to my PM. The uploaded file has been deleted from servers so I can't download it. I tried also incorporating them in the firmware of the card itself but no luck, the firmware updates but the card is still in IDE mode. I have not made it to change to AHCI mode yet. I have a programmer device so it's not a problem to experiment, but I don't know what exactly I have to change in the bios file itself to make it work in AHCI mode. I have successfully changed the card PCI ID to 1b4b:9128 because it uses the Marvel 88SE9128 chip and the card works but still in IDE mode. I can upload the firmware if someone knows how to modify it so the card will work in AHCI mode. Do I only have to change the Class of the card from 0101 to 0106 or there is more to it? please see the blog post, section "Read before commenting", section 1. Is this line still valid? The previous commands executed without issue and my server has internet access. you probably have already installed the package before!? Check with "esxcli software vib list | grep xahci"
If yes, can you please send me the /var/log/esxupdate.log file from the host (via mail to info@v-front.de)? Would be great if you could add that one as well! I added this one today in version 1.11! Enjoy the festivities and happy new year! Then I added a line concerning my controller (Marvell) at the end of the xahci.map file. This was found within the etc map somewhere. Afterwards i revibed it to sata.vib and used the customizer mentioned here to create an new iso. see my comment before. The 1b4b:9123 is already included. The ahci driver is loaded for it and it should show up as [vmhba2]. I have no idea why you do not see the disks attached to it (if any?!). Could you please add support. this controller is supported out-of-the-box. The ahci driver is already loaded for it and it should show up as [vmhba0]. Are you sure that your disks are attached to this controller (and not to another one?). ...now the disks that are attached to the AHCI controller aren't available/not listed via format cmd. These disks (5) are part of a ZFS zpool. Do I need to get a SATA controller? My motherboard has 2 PCI-E slots (x8 & x4) the (x8) is used as raid-0 for the storage OS. Since there are limitations, what kind of SATA controller do I get? it sounds like you are using this controller for passthrough to a VM (right?). You don't need an ESXi driver for passthrough devices. Obviously passthrough was broken for your device by upgrading to ESXi 5.5. Sorry, I cannot fix that. Thank you very much. You've made my day/week. I am reading people having problem with the MARVELL tech 88SE9123 driver not showing any disks. I do have this same problem. I am using a PEXSAT32 2-port PCI Express 6Gbit/s SATA 3.0 Controllercard. The thing is that the manul says that it needs to use the chipset Marvell - "88SE9128". But Esxi is instead ( i am currently still using 5.1) using Marvell - 88SE9123. Could this be the problem that there are no disks detected? In the vsphere client the storage adapter is showing the controller as it should be: Marvell - 88SE9123 PCIE SATA 6.0 GB/s controller. Only with the 9123 driver loaded and no disks detected. There are currently two 1 TB disks attached to the 2 ports on the SATA card. No, this won't make a difference. It is always the same driver that is loaded (the generic ahci driver). This controller is already supported out-of-the-box. If you are using it for passthrough and cannot access your disks anymore then please see this comment. hiya,so much help my server. so couldn't you support about this? Dear sir, Would you please add this one? Please see the blog post, section "Read before commenting", section 4. The same as above applies here on the Gigabyte Z87X-D3H Board. Thank you for your efforts. I wonder how can one change this list (xahci.map) without your assistance. I added this controller in version 1.12! You may find instructions about how to modify the package yourself (and the tools for it) at the ESXi5 Community Packaging Tools project page. However, I don't want to encourage anyone to do this, because I want to prevent ambiguous forks of the package, and I think that a lot of people do still not understand what the package can do for them, and those may fiddle around with the package while having wrong expectations. Thanks. For now I managed, using NFS for datastore, and USB disk on key for the OS. However, I will download your version and give it a try. as a PCI-E SSD for ESXi 5.5. I followed the instructions and installed sata-xahci. No attached devices are recognized. Any ideas why the attached SSD drive is not visible? sorry, I have no idea. Please see the blog post, section "Read before commenting", section 4. You may want to send me a copy of your /var/log/vmkernel.log file of your ESXi host (via e-mail please), so that I can have a look at it. Grab it with a web browser via the URL https://ip-of-your-host/host. Andreas, you created version 1.8 after I requested for 1b4b:9182 (for the solo x2). Thanks for your help! Eventually I discovered that ESXi was detecting the controller but not the drives connected to it. The same was true for a completely different card with the same chipset. Recently, I gave up and used a different card (solo x1) with an asmedia chipset that works fine thanks to your sata-xahci. Strangely my vmkernel.log file seemed to suggest that everything was fine except that ESXi apparently had no idea that there was a drive connected. I appreciate what you are doing, and I wonder if you can do a little more? I have have an Intel Patsburg 6 port SATA AHCI with a class of 0106: 8086:1d02. I wonder if you can help out? BTW, even this driver add support for ASM 1062 esata adaptor, it still too slow, for use. try to check and change the queue depth by following instructions in http://kb.vmware.com/kb/1268. I have a short question about your changes to the driver. I assume you have added further PCI device/vendor IDs to the driver to get AHCI compliant interfaces working with the driver. Do you know if the PCI sub-vendor/device IDs are also taken into account when loading the driver? I'm asking because I have a board with 2x Marvell 9172 controller and it seems there are no devices detected. I'm currently at the beginning of my investigations so I'm not sure if it's a problem of the ISO image I created thanks to your tool, a problem with the board or with the detection of the drive itself. Can you confirm that the 0000:0000 means what I assume? I'll have a look if I can manage to change the values according to the entries in the PCI headers of my motherboard (Asrock C226 WS) in order to operate the interfaces in ESXi 5.5. I did some tests with a modified installation CD using the offered driver as well as with a driver which has added subdevice and subvendor IDs. Unfortunaltely that didn't help. The driver seems to be included correctly into the image (logs show that the controller is available), but the system has problems to detect the attached device. According to the output of dmesg, the ESXi 5.5 detects that something is connected, but me error message says that it cannot identify the device. The situation is the same on the two Marvell 9172 controllers as well as on a add-on card I found using the Marvell 9120 controller. I'm ahead with the investigations. The problem is not the driver or the iso creation. The problem seems to be linked to the controller itself. The problem seems to be caused by the Marvell when it's using PCIe phantom functions - a VT-D related functionality. These functions are disabled in the PCIe capability of the Marvell controller. But according to the logs of ESXi, it uses phantom functions and confuses VT-D/IOMMU. Google revealed a bug report, which indicates the problem is not limited to ESXi or anyhow related to it. It seems to me to be clearly an issue of the controller. Therefore for anybody who plans to use VT-D and want to use it for ESXi: Avoid using a Marvell controller. Assigning this controller to a VM may work. this is an awesome finding, thank you very much for doing these investigations! I will update my post to include this information. I contacted Asrock and explained the issue to them. They discussed that with their R&D department but currently there's no action planned by Asrock. So, don't expect a fix within a reasonable time frame. But OK, I have some doubt that Asrock can do here something because as far as I see, it's not their fault but the problem is linked to Marvell. Hi Andreas , Johnny is my name. Great work you are supplying us VM-users with. I wonder if you could incorporate the following to your map. added in 1.13. Have fun! Im struggling to get a Vertex OCX 60GB drive working. and I can see my SATA disks fine. The Vertex SSD worked well in my ESXi 5 Machine, however im moving it to a new machine (new processor, new motherboard) for which the Realtek NIC drivers have been brought back and work well. Its just the SSD thats not being recognised. VT-D is off in the Bios and the Bios does see the disk. does not show the SSD, but does show the other three disks and iSCSI (moving all over to iSCSI, just the SSD will remain as local cache file. Mmm... I reinstalled 5.5 onto the OCZ disk this time... now it sees it. Interestingly, the previous settings were all retained as if the installer read the old disk and included the 8168 drivers for the GA-Z87 motherboard. Yes, old disks still attached. I'll remove CD and smaller disk at a leter date. For now, everything is working as I hoped. Mmm... (Part 2) After two purlpe and blue screens the OXO disk is going to the place in the sky, or worse. Googling these drives everyone seems to be having trouble. Would you please add support for the following (Mac Mini 3,1)? added in v1.14. Have fun! if there is no option to disable VT-d in the BIOS then you may want to try disabling VT-d IRQ remapping in ESXi as per KB1030265, but I'm not sure if this disables VT-d completely. Hi Andreas, thank you for your response! I am stuck with this too, I am using a ASUS RAIDR PCI card with a marvel controllers (and sandforce SSD controllers), on a Dell R720. The Dell only has Enable/Disable "Virtualization Technology" and it covers both VT-x and VT-d. The drive works when I disable VT in bios, but I need VT-x. I disabled the remapping via the link above but it did not help. I have reached out to Dell for help disabling VT-d. I'm just not getting if the bug is in the ESXi kernel or in the Marvell firmware. If it is on Marvel firmware, why the disks are detected in OS X but not in ESXi? Still no luck on getting the disks detected. On which front should this be fixed? Unfortunately, I can confirm that Marvell 92xx series chips also suffer from the VT-D bug. My motherboard has a 9120 that wasn't working and I needed the missing ports, so I bought a 9230-based PCI add-on card and it's displaying the same symptoms (Storage adapter is recognized, but no devices are visible with VT-D enabled) in ESXi 5.0 U3. Can anyone recommend a low-cost SATA add-on card that doesn't suffer from this issue? I know the IBM M1015 and LSI-based cards work, but I would really rather not spend $100+ just to replace the two ports that aren't working. SATAIII would be preferable, but I can live with SATAII if need be. -I'm just going to assume that everything Marvell-based won't work. -LSI-based controllers such as the IBM M1015 are known to work, but aren't cheap (~$100) if you're just looking to add a couple of ports. -I can't find much of anything about the Silicon Image 3124/3132 chips with recent (5.0 and later) builds of ESXi work when passthrough is used, but it seems a lot of the reviews I've found consider them unreliable in general. It's based on the ASMedia 1061. I've found one or two reviews that had problems with it, but I think they were trying to pass through the entire onboard SATA controller and use the add-on card for datastores or something along those lines. I've also found other reviews (such as those in the Newegg link above) that says it works natively with ESXi 5.1, but one user was passing it through to a VM and it's not clear if the other was using VT-D. Does anyone have experience with ASMedia 1061-based cards? I'd be using it for datastores, but VT-D is enabled to pass through other devices to my VMs. Good news: the ASMedia 1061 card I referenced above WORKS in ESXi 5.0 U2 and 5.0 U3 when VT-D is enabled! U2 sees it as an "unknown" storage adapter and U3 recognizes the chipset, but both versions are able to access datastores connected to it when VT-D is enabled and other devices are passed through to VMs. Can you add the following please (if it makes it easier looking to get passthrough support only)? I added the first one in version 1.15. If you can switch the second one to AHCI mode (it's now in RAID mode) it may also work - it will probably change its PCI ID then. Thanks you Andreas! Will test and let you know my results. Maybe I am missing something. I am not seeing v1.15 available on http://vibsdepot.v-front.de. Will the esxcli software vib install -d http://vibsdepot.v-front.de -n sata-xahci pull the version 1.15 version even if it is not showing on vibsdepot? this is the PCI ID of an nVidia Ethernet Controller?! 0000:07:00.0 SATA controller Mass storage controller: Marvell Technology Group Ltd.
0000:08:00.0 SATA controller Mass storage controller: Marvell Technology Group Ltd.
How can I create vib file with correct drivers to install it on my ESXi 5.5 server? you can install my sata-xahci package to make the controller visible to ESXi, but a bug in the Marvell controller's firmware will lead to the attached disks not being accessible unless you disable VT-d in the server's BIOS (see issue no. 4 in my post). Thank you for your help and suggestion. I have a question. You know in the Virtualization Server needs to enabled the VT-d /Intel® Virtualization Technology for Directed I/O (VT-d)/ function in the Bios. Everything will be right on the production ESXi server if I disable the VT-d function in the Bios? I checked Tempo SSD Pro card has only rev 1.0 firmware only. I solve and installed your driver. The Dell only has Enable/Disable "Virtualization Technology" and it covers both VT-x and VT-d. The drive works when I disable VT in bios, but I need VT-x for vCenter, too. I disabled the remapping and rebooted but it did not help me. I'v read the "DMA Read on Marvell 88SE9128 fails when Intel's IOMMU is on" bug report, too, but there isn't solving for this problem, yet. What do you mean, when will be solving this Marvell chip and ESXi 5.5 bug? Sonnettech said me: "At this time, I’m not aware of pending firmware updates for the Tempo SSD cards that would enhance this specific usage for the cards." A global question is how can I disable VT-d only in DELL R710 or R720 bios, if there is no possibility separately? Great article, information and drivers!!! Thank You, Thank You!! I do have another question - the drivers load for my Marvell 9230 but I cannot "see" the hard drives under the configuration. I'm using it in a RAID1 configuration so I would like to see if one of the drives fail. Any suggestions on getting this working would be greatly appreciated! I have an Intel NUC D34010WYK with the Class 0106: 8086:9c03 adapter. But somehow when i want to install esxi the esxi install does not recognize my msata disk (Crucial M500 128Gb). have you installed my sata-xahci package? It should enable support for this adapter. If this does not work then I cannot really help further, sorry. The results is same that on ESXi 5.5 U1, because of the storage adapter information displayed in vSphere Client under Storage adapters list (http://imgur.com/vqy6Uy1), but device, targets, path are zero, there are missing details. I've modified the iovDisableIR configured value to TRUE (http://imgur.com/GDHp623) and rebooted. I've tested your sata-xahci v1.15 under ESXi 5.1 U2- build:1612806, but it didn't work, too. In the Advanced settings /Configure Passthrough/ the controller information and device details showing well (http://imgur.com/QKQJzZ9), but I wouldn't like to use this mode. What do you suggest, how can we resolve this driver problem under latest ESXi 5.1 U2 build number:1612806 ? I'm sorry, but it looks like the only solution that is available right now is to disable VT-d in your computer's BIOS. If this is not possible then you are out of luck.